Washington, D.C. In the continued efforts to develop basketball throughout different regions of the world, the SBA Sports and Entertainment Group announces an upcoming tour to South America. The SBA's International Street Basketball Development Program has been expanding within Africa and Asia over the past year and the SBA is now proud to introduce a strategic alliance with the Honorable Haro Foundation and Basketball South America, aimed at promoting basketball development at the grassroots level as well as providing entertaining and exciting basketball spreading the growing interest and love for the game to a continent where soccer is the dominate sport. While on the upcoming tour to South America the SBA All-Stars will implement several of the SBA Street Ball Initiatives, administering basketball clinics and expos, producing SBA Shows, and organizing a number of exhibition games versus professional teams representing their top leagues. "The interest in basketball is growing rapidly in South America with top leagues in Argentina and Brazil. We are excited to see the talent level and overall athleticism and enthusiasm for the game from the South American players and fans," states Matthew Rosner, Director of Basketball. While touring South America representatives from the SBA will consult with the management of professional leagues in Ecuador and Peru looking to solidify the infrastructure of their leagues setting them up for future growth and expansion. 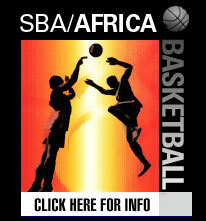 Founded in 2001, the SBA has spearheaded the growth and development of the street ball industry globally producing countless events throughout the United States, Europe, Asia, and Africa from tours, shows, and demonstrations, to competitions, clinics, and expos entertaining and educating fans worldwide. With the SBA, the Honorable Haro Foundation and Basketball South America has aligned itself with the explosive growth of street ball working with an organization that continues to be a valuable asset for top businesses, companies, and teams and leagues in the world seeking basketball/street basketball consultation development, and event management and marketing support. 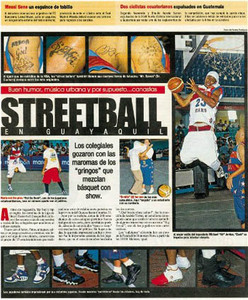 During the SBA's South American Tour the SBA will feature the SBA Show and Expo, a one-of-a kind fan interactive entertainment attraction and marketing vehicle that consists of slam-dunking and free-style dribbling demonstrations, shooting contests, fan interactive clinics, street ball show routines, autograph and photo sessions with the SBA All-stars, and the turn-key SBA Show Exhibition featuring the SBA All-Stars. "The Show" will further promote the authenticity surrounding the best professional SBA Street Ball All-stars recreating the atmosphere similar to the legendary Rucker Park in New York City and the Urban Coalition in Washington, D.C. The Show combines the SBA's electric brand of street ball with hip-hop music to create a model unlike any other basketball entertainment product. The SBA All-stars have been featured on ESPN Street Ball, ESPN City Slam, NBA TV, MTV, EBC Rucker Park, Hoops TV, Nike BattleGrounds, AND 1 Tour, Slam, and Dime Magazine. Jerrod Mustaf, President of the SBA, states that the upcoming tour "continues to strengthen the SBA's position within the world of basketball giving organizations interested in marketing and developing the sport globally the opportunity to be associated with a rapidly emerging and experienced international basketball company. The SBA has become a leader in international basketball with a number of grassroots development programs and basketball entertainment shows, and we look forward to continuing our growth with SBA industry contacts and partners strategically placed throughout the world." The SBA Sports Management and Entertainment Group is a full service Sports Marketing and Event Management Company primarily focused on the business of basketball offering turnkey entertainment events and sports properties. From the beginning process of event creation and planning, through full-scale management, operation, and production of the event, the SBA provides optimal solutions to maximize the value of the individual sports property. The SBA gives corporate organizations, both profit and non-profit, the ideal vehicle to penetrate the sports marketing arena as well as increase consumer awareness and create positive public relations for their products, services, and corporate mission. The Honorable Haro Foundation / Basketball South America is a basketball foundation and organization set up to promote and develop of the sport of basketball throughout South America. In addition, the Honorable Haro Foundation's mission is to develop the youth through sports reaching out to communities and cities in Ecuador and Peru.